About the Book: In June 2015 a group of people, for most part strangers to each other, gathered at the serene campus of the Indian Institute of Advanced Study in Shimla. This, once the private space of the Viceroys and Presidents of India, has since 1965 been a public space to be inhabited by scholars and visited by tourists. 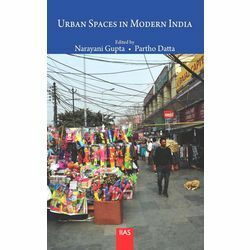 This particular group spent two days discussing urban spaces in modern India, bringing together insights from different disciplines, and spanning a range of towns. Serendipitously, a mosaic of modern India emerged. The sacred in the city – a river, a math; the ‘slum’ as defined by planners and as constructed by townsfolk, ‘informality’ in the interstices of the formal, middle-class disapproval of the nomads and the marginalized, the town as visualized by artists with paint-brush and with camera. What we hear is not simply a litany of ‘urban problems’ but stories of spirited people who never give up.